ANATOMY OF THE HUMAN EYE: What is the thickness of the sclera? The sclera is the white tunic that covers and protects the eye. At the insertion of the rectus muscles (posteriorly) it is thinnest 0.3mm. At the equator it measure 0.4-0.5 mm and at the posterior pole in measures 1.0 mm. The thickness of the sclera is relevant to areas prone to rupture. Blunt trauma most frequently results in rupture of the eye at the thinnest site, behind the insertions of the rectus muscles. At the entry site of the optic nerve, the sclera is perforated in a sieve like structure to admit optic nerve bundles, axons of ganglion cells. This sieve of sclera is called the lamina cribosa. In addition there are other channels through the sclera called emissaria. Posteriorly there are aperatures around the optic nerve through which the long and short posterior ciliary arteries and nerves pass. About 4 mm posterior to the equator apertures permit the passage of the vortex veins. Anteriorly, anterior ciliary vessels, branches of vessels to the rectus muscle, and nerves pass. Recurrent nerve loop of Axenfeld- Described in 1895 by T. Axenfeld was a nerve that makes a loop in the sclera (arrow 1) anteriorly. The nerves travel through the sclera usually originating from the long ciliary nerves (arrow 2) and some may approach the surface of the sclera about 1-6 mm from the limbus (arrow 1). The nerves bend 180 degrees creating a mushroomed loop at the surface (arrow 3). The nerve loops have been described to produce symptoms of irritation and tenderness. A study by Stevenson showed that about 12% of eyes have nerve loops and that the nerve loops are bilateral in 1.0%. Topographically, nerve loops were not found in the horizontal plane anterior to the medial or lateral rectus muscles. 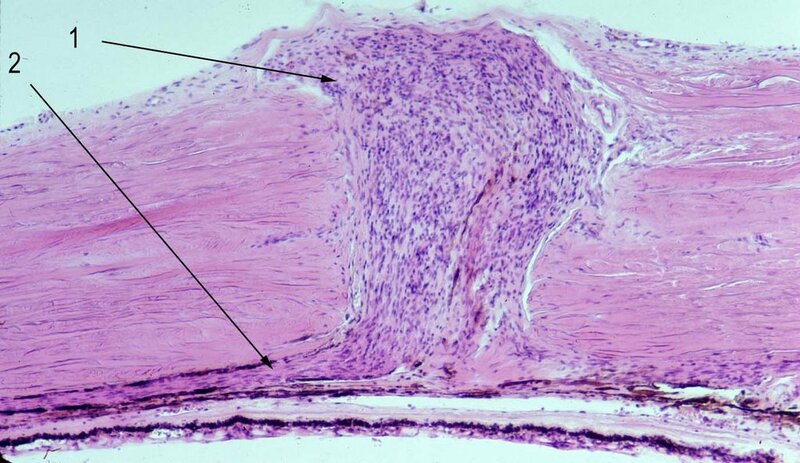 Most (70%) are found inferiorly. 62% are found anteriorly to the vertical rectus muscle insertions (44% inferiorly + 18% superiorly). 38% are found in the quadrants particularly in the inferonasal quadrant (18%). The nerves are accompanied by pigment and may produce an elevated nodule on the sclera surrounded by a ring of pigment. The ignorant well meaning resident may foolishly attempt biopsy, exquisitely painful for the patient. For more information click this link. The sclera is composed of fibrous tissue ranging in thick from 10-140 microns. The sclera is rich in elastic fibers and contains smooth muscle. Stevenson, TC, Intrascleral nerve loops, AJO 1963, 55:935.